This part of our detailed circular saw reviews series starts by looking into what kind of saws are available for todays woodworking market. Let's put circular saws into different categories first. There are various categories that makeup the circular saw market. In North American attributes such as blade size (blade diameter) is a key criteria. 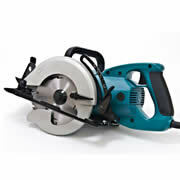 For example an 8-1/4" blade offers the craftsman a large circular saw that will cut 2-7/8" deep. To the contrary using a circular saw in Europe you would most likely categorize it by depths of cut and much less looking at the blade diameter. The following table shows a combined approach to group circular saw into five major categories. ~ 4 kg 10 lbs. ~ 4.5 kg 12 lbs. ~ 5.5 kg 18 lbs. Notes Typical lightweight circular trim saw. This group includes all mini or miniature circular saw types. Easy to handle. Main cabinetmaker circular saw, with enough power and DOC (Depths of Cut) to cut 2" logs over a longer period of time. An increasingly popular handheld circular saw size about to replace the medium size circular saw, offering extra DOC at 45° angeled cuts. Carpenters first choice. Enough DOC to cut three logs at once. Still a portable circular saw type. Usually with lots of power. These extra large circular saws are used mostly by contractors, roofers, and framers. These trades tend to have one of the common worm-drive skilsaws vs the ordinary sidewinder design. The worm-drive saw is very heavy! Sidewinder shape circular saws are the most popular type of saws and found across the circular saw world. The saws motor is attached to the blade at a 90° angle that allows for a lightweight compact design. The worm-drive skilsaw uses the 'angle grinder' design. The motor sits alongside the blade. Worm-drive circular saws are generally known for unstoppable power, with a much heavier but less balanced tool. When using a circular saw with worm-drive it might feel a bit less controlled since saw handle is more distant to the blade center compared to sidewinder shape circular saws. Traditional circular saw design with motor mounted at a 90° angle to the blade. Makita worm-drive circular saw. When deciding which circular saw to purchase, you’ll discover that there are two basic manufacturing concepts with circular saws being one of the few power tool categories offering both left handed and right handed designs. When it comes to the question of how to use a circular saw properly, this is a very important part to look at before you decide which type of saw you might buy. Craftsmen seem divided about the usefulness and safety of either handed power tool. The difficulty with using the wrong handed tool is an obstructed view of the circular saw blade, evidenced when opposite handed person uses it, the view of the site-line is blocked which is a safety hazard. The craftsman using the correct handed saw allows an un-obstructed view of the cutting blade. Hold a right handed circular saw correctly (your right hand on the main switch handle, and your left hand at the front handle) and you'll have a clear view of line-of-site. On the other hand, if you're left-handed, holding the same right handed saw with your left hand on the handle, and the other hand on the front handle, you'll have a completely obstructed view of the (cutting) line-of-site. Thats where a left handed circular saw (other word for left blade saw) might be the better choice for you. Made for the right-handed craftsman, this Bosch corded circular saw (with motor mounted to the left of the blade guard in the cutting direction), is the typical standard circular saw design. 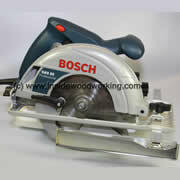 This Bosch cordless circular saw is a left handed model. 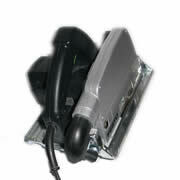 Picture shows how holding it with one hand (the right hand), decreases your visibility of the blade or line-of-cut. 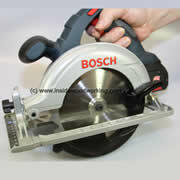 (only a few power tool manufacturers make or made left-handed circular saws). Among them are Milwaukee, Porter Cable, Skil and DeWalt. For small or mid-size circular saws, it won't matter much whether the left or right handed circular saw, since most cuts are done with only one hand on the saw.